Part 1 Introductory issues: Overview of health-promoting compounds in fruits and vegetables; Consumer attitudes towards fruit and vegetables; Marketing healthy fruit. Part 2 The health effects of fruit and vegetables: Fruits and vegetables and cancer; Fruits and vegetables, cardiovascular disease, diabetes and obesity; Epidemiologic evidence for the effect of fruits and vegetables on cardiovascular diseases, diabetes, and obesity; Beneficial effects of phenolic compounds from fruits and vegetables in neurodegenerative diseases; Fruits and vegetables (FAV), energy balance, and weight management. Part 3 Understanding fruit and vegetable phytochemicals: Physiological and ecological functions and biosynthesis of health-promoting compounds in fruit and vegetables; Rapid analysis of phytochemicals in fruit and vegetables; Clinical evidence for biological activity of fruit and vegetable phytochemicals. Part 4 Effect of pre-and post-harvest technologies on the health-promoting properties of fruit and vegetables: Traditional breeding to enhance the phytonutrient content of fruit and vegetables; Genetic manipulation of vegetable crops to alleviate diet-related diseases; Agronomy and the nutritional quality of fruit; Agronomy and the nutritional quality of vegetables; Storage and handling of fruits and vegetables for optimal health-related quality; Postharvest enhancement of bioactive compounds in fresh produce using abiotic stresses; Processing techniques and their effect on fruit and vegetable phytochemicals. Part 5 The nutritional quality of particular fruit and vegetable products: Fresh-cut fruits and vegetables; Organic fruit and vegetables; Extraction and concentration techniques for bioactives from fruit and vegetables. Consumers are advised to increase fruit and vegetable consumption, but the health effects of increased intake are not fully understood. 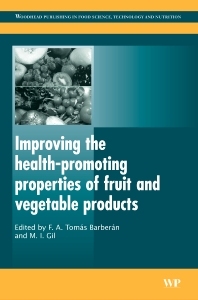 This important collection brings together information on the health-promoting properties of fruit and vegetables. Introductory chapters provide an overview of fruit and vegetable bioactives and consumer attitudes towards fruit and vegetables. Part two discusses the health effects of fruit and vegetables in relation to specific diseases, including cancer, cardiovascular disease, diabetes, obesity and neurodegenerative diseases. The focus in Part three is on understanding fruit and vegetable phytochemicals. Chapters cover physiological and ecological functions and biosynthesis of health-promoting compounds in fruit and vegetables, rapid analysis of phytochemicals in fruit and vegetables and clinical evidence for biological activity of fruit and vegetable phytochemicals. Part four chapters review the effect of pre- and post-harvest technologies on the health-promoting properties of fruit and vegetables. Topics covered include traditional breeding and modern processing techniques and their effect on fruit and vegetable phytochemicals; genetic manipulation of vegetable crops to alleviate diet-related diseases; agronomy and the nutritional quality of fruit; storage and handling of fruit and vegetables for optimal health-related quality and postharvest enhancement of bioactive compounds in fresh produce using abiotic stresses. The final chapters in Part five look at the nutritional quality of particular fruit and vegetable products, such as fresh-cut fruit and vegetables and organic fruit and vegetables. Improving the health-promoting properties of fruit and vegetable products is a valuable reference for those working in the fresh and processed fruit and vegetable sector of the food industry. Professor Francisco Tomás Barberán is a senior researcher in the Department of Food Science and Technology at CEBAS-CSIC in Spain. Dr María Isabel Gil is a senior researcher in the Department of Food Science and Technology at CEBAS-CSIC in Spain.